Michigan’s new marijuana legislation is the latest win for the American cannabis industry. 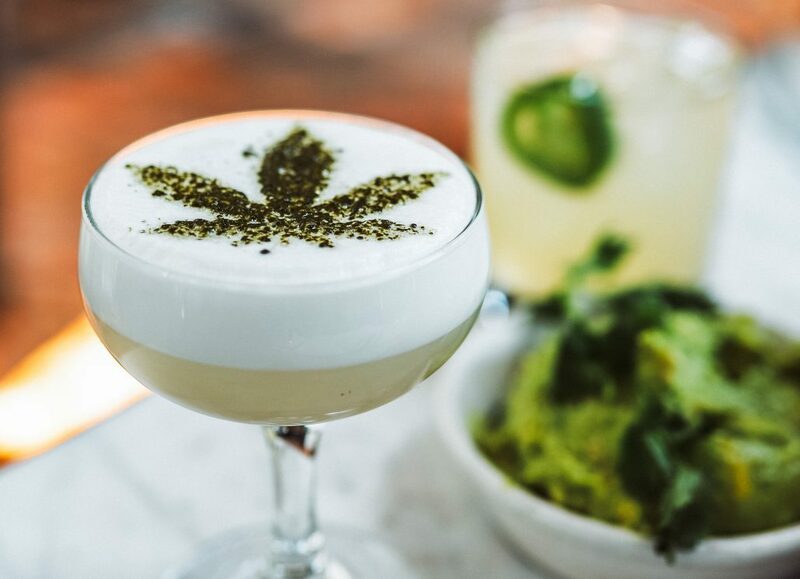 With US sales expected to generate over $40 billion by 2021, industry entrepreneurs have been taking their stake of the market in the form of cannabis-infused drinks, edibles and topicals. It should come as no surprise that these are items you’d typically find in your pantry. Cannabis brands want to normalize marijuana as a part of an everyday consumer experience, and have already done so through eye-opening, realistic advertisements. And despite the historical taboo that once had a grip on many Americans (no thanks to the masterpiece Reefer Madness), the biggest opportunity now is dispelling the “stoner stereotype” while appealing to the broad market. But who are the consumers? Cultural lore suggests that stoners are generally lazy young males living in their parent’s basement. To a remarkable degree, today’s potential marijuana demand actually comes from women. 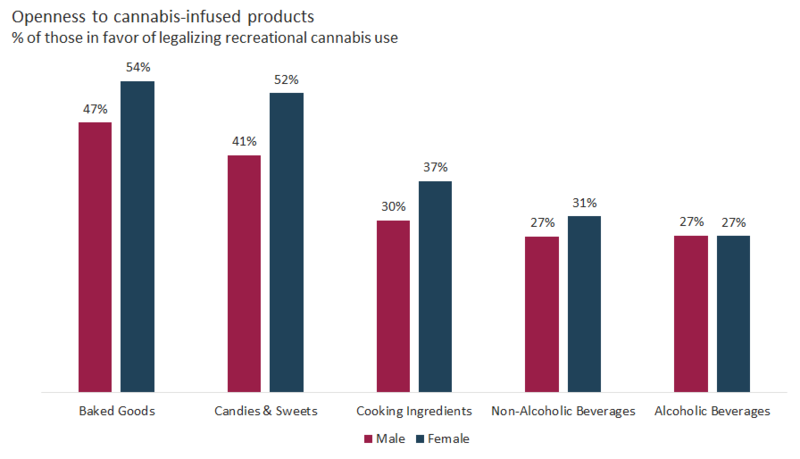 Of individuals in favor of recreational legalization, women are more likely than men to express interest in ingesting cannabis infused products if they’re in the form of baked goods, candies, cooking ingredients and non-alcoholic beverages. 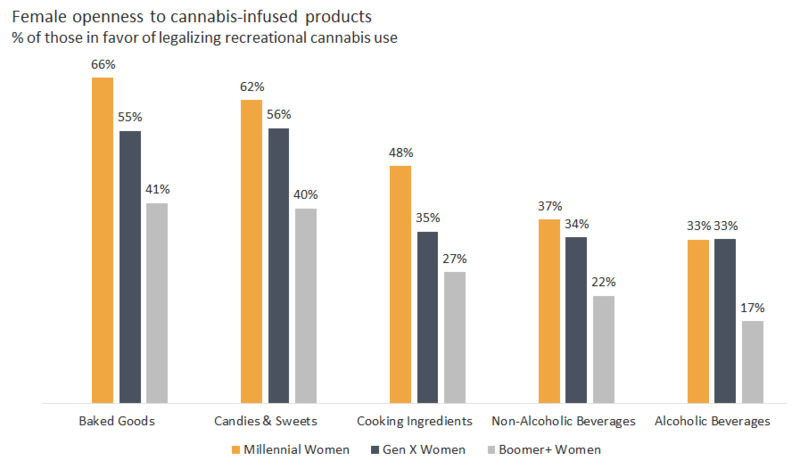 And when you take age into consideration, the desire to consume marijuana infused products is the most prevalent among millennial women. Given what we have learned in our America in 2019 study about the stress many Millennials feel, perhaps marijuana is being perceived as a way to relieve anxiety. The preference for edibles and candy among women may suggest that discretion might be key to getting Millennial attention: edibles don’t smell and they’re perfect for using on the go. And for first-time consumers, edibles and candy offer up a different appeal. Individual servings take the question out of dosing and ease the risk of “overdoing it,” which is otherwise a challenge when using inhalants. Being female isn’t the only surprising factor associated with an interest in marijuana. 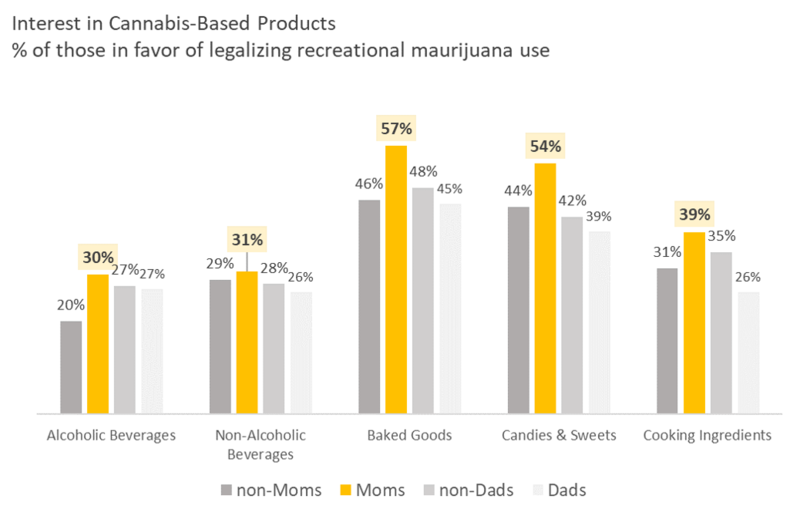 Of women who approve legalization for recreational purposes, our data show that those with kids are even more interested in products containing cannabis. Given this data, it’s easy to imagine a future where the modern mom is trading up wine bottles for weed buds, unwinding from stress using cannabis. This notion subverts the stereotypical narrative that all good moms are anti-pot. The trend is only likely to grow given the greater openness of Millennials, especially as more and more Millennials enter parenthood. What’s the big takeaway? Sure, entrepreneurs and their counterparts in large corporate food & beverage companies looking to capture this share of the market obviously need to pay close attention to how cannabis may be fitting into the lives of Millennial woman. But there is a lesson for all marketers: this surprising shift in interest toward cannabis among Millennial women with kids may be reframing the very idea of modern family and what it means to be a good mom. Interested in more data like this? Please complete the form below.